The scientific name for the staghorn fern is Platycerium holtummii. Staghorn ferns are tropical perennials that are usually placed in moss and hung on wooden boards. 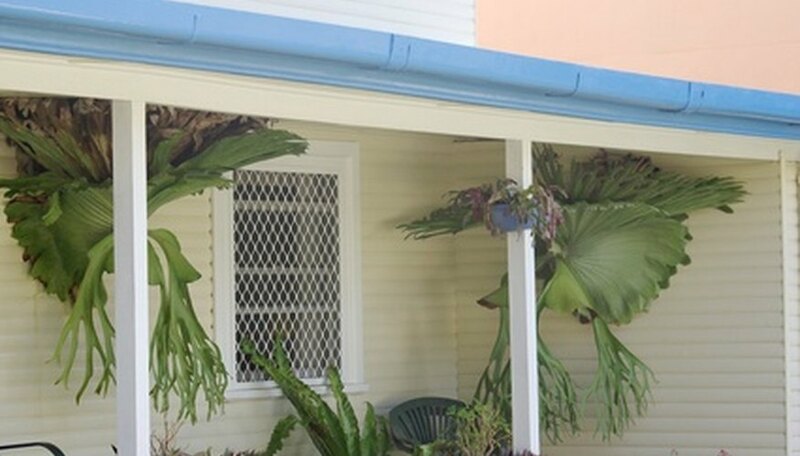 The staghorn fern grows sideways unlike your average ferns. If you have a staghorn fern, you will need to know how to water and feed it. Surprisingly, one of the things staghorn ferns like to eat the most is banana peels. Banana peels are rich in potassium, which is a nutrient staghorn ferns need to stay healthy. Water your staghorn fern once per week. In the summer you may need to increase this to twice per week. Just be careful you do not overwater your staghorn, which is a commonly made mistake. Feed your staghorn fern a 5-1-1 fish emulsion fertilizer. This organic fertilizer is used on tropical plants like the staghorn fern, and is on the milder side. Follow the fish emulsion fertilizer instructions to apply it to your fern. Repeat once per month to give your staghorn fern the nutrients it needs. Set the peel from a banana down in between the moss and the board it is mounted on. Staghorn ferns don't need to eat banana peels too often so just feed the fern one banana a month. You don't need to remove the banana peel either. It will decompose over time. If your fern is on the larger side use two banana peels. Fish emulsion fertilizer has a very strong, and somewhat unpleasant odor.